Beta Version: A pre-release & incomplete piece of software that is given out to users to test under real conditions. You join Beta-testing of KetoDiet at your own risk. An Android device running Lollipop and later (API Level >= 21) - Sorry we don't support older versions. Users will need to have a Google Play account - no other Android stores are supported. 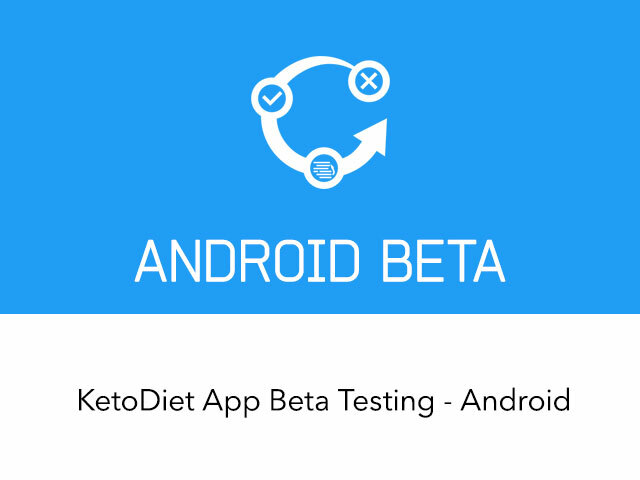 Our current plan is to Beta-test over the next couple months or until we feel KetoDiet for Android is ready for release. Your feedback is vital - this is not just a chance to try KetoDiet on Android, but an opportunity to provide feedback and help make KetoDiet a truly great app. How do I provide feedback and ask questions? Your feedback matters, please use our dedicated forum to let us know what you think. Please, do not send us support emails for the Beta version. You'll only get a response if you post your question in our forum. And this is just the beginning...! To be included in Beta testing, reply to this message with the device(s) you'll be testing on (Android only). Please make sure you reply to the existing message using the link above. Users posting new messages will not be included in Beta testing. Reply to Join Beta Testing! Users should focus on testing the overall UI and usability. Let us know how you find the app, e.g. creating custom meals, custom ingredients and planning your days. Is there something you find confusing? Something seems wrong? Please, let us know by posting in our forum. KetoDiet Basic for Android is Out! KetoDiet is Now Available on Android!